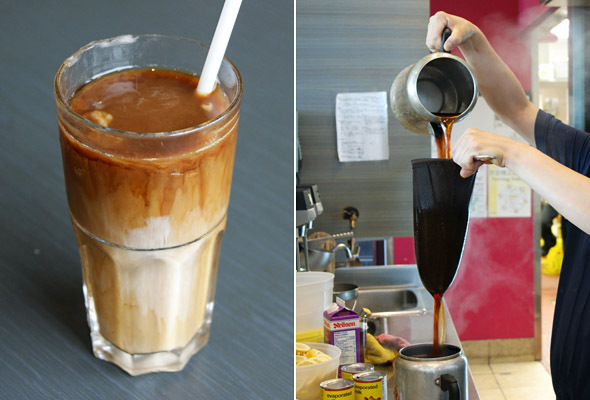 Phoenix restaurant is where my family congregates for a Hong Kong café food fix and a cool glass of their signature milk tea. 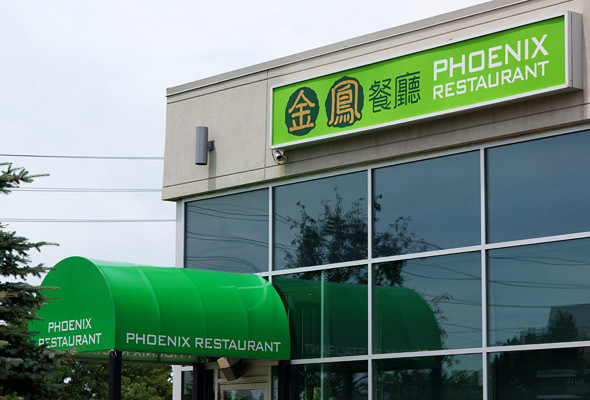 Whenever we head out for a casual family meal, we join the masses at one of Phoenix's two locations in Markham. Their newest location just off of the 404 on Woodbine showcases a fresh new look, while maintaining a no fuss approach to simple, satisfying dishes. Chicken balls, General Tso, Sweet and Sour pork and other items invented for western palettes are thankfully omitted from their extensive menu. Instead, there are innovative items bearing curiously familiar names: Spaghetti Bolognese, French toast, waffles... Welcome to western food adapted to Asian taste buds! 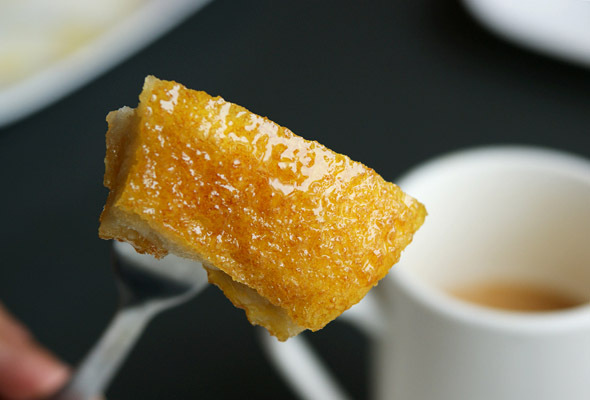 A hodgepodge of colonial influences left an imprint on contemporary Hong Kong culture, where any typical café's menu can be easily interpreted as a history textbook. Pantry staples like ketchup, Worcheshire sauce, condensed milk, cheese and creamed corn are the base sauces of most meat- centric dishes, paired with Chinese fried rice or noodles. Owners Carmen and Jack Lee care about what their patrons think. The couple often poses as common diners to ensure that the service is up to par and take note of any comments or criticisms that they overhear. With a third location in the works, Carmen continues to abide by the restaurant's original vision: "I want to make a place where everyone feels comfortable. Where we can attract fickle youngsters with new fusion dishes, as well as appeal to more mature clientele by offering fun twists on classic favourites," she says. On this particular visit, we predictably stick to tradition. Curry beef brisket ($8.50) is deceivingly simple, but complex in flavour. Slowly braised, the brisket is remarkably tender. 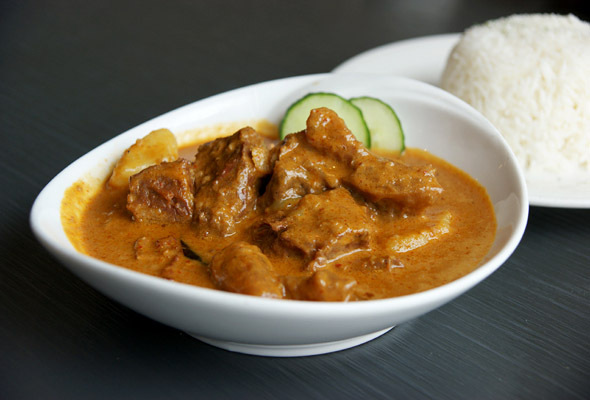 The creamy red curry has a nutty quality from their fragrant house blend of spices and complimented by the buttery coconut milk base. 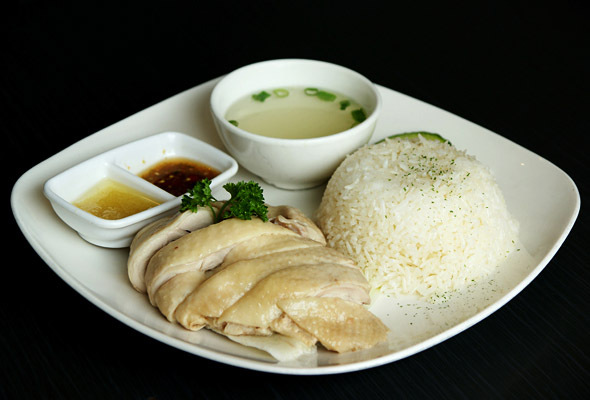 Iron Chef , every bite makes me reexamine the subtle flavours of chicken all over again. I am slightly deterred by the fluorescent colour of the Tomato Pork Chop Baked Rice ($7.50), but the taste is authentic. 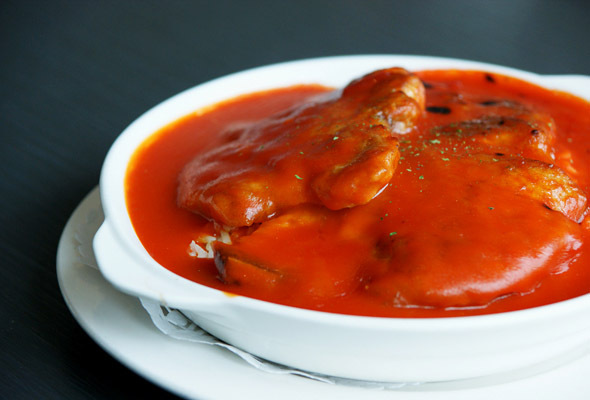 The crisp pork chop over a bed of perfectly fried rice and doused in tangy tomato sauce brings back fond memories of sweltering summer nights in Hong Kong, spent at the air conditioned corner café. Our family lunch slips into afternoon teatime (served between 2:30- 4:30PM daily). 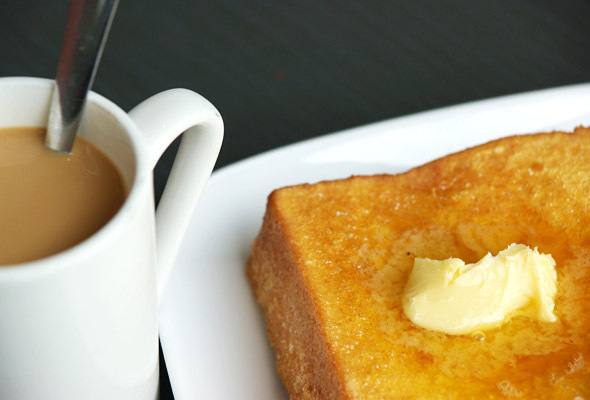 Thick, golden French toast with a choice of coffee or tea is a bargain at $4.75. A "Pineapple" bun, named for the cross hatching over the top crumbly layer, is toasted and sandwiches a generous slab of melting butter ($3.50 including coffee or tea). pantyhose to achieve silkier results. These days both the kink and stockings are set aside, but the tea blend used is still a highly guarded secret and varies greatly. As for my parents final verdict: My Mom is convinced that the same items taste better at the original location, while my dad seems content in familiar surroundings, as he quietly sips his iced coffee while glancing over his newspaper. Me, I'm just happy to be having good food with a side of family bonding time.